Indicator ZLS (Zero Lag Stochastic) - a zero-delay stochastic - a ratio of several stochastics with different periods %К, deceleration, and weights. Smoothing - the indicator signal line smoothing period (the only parameter common to all the stochastics). Stoch 1 %K period - %K line period of stochastic 1. Stoch 1 %D period - %D line period of stochastic 1. Stoch 1 Slowing - deceleration of stochastic 1. Stoch 1 Method - stochastic 1 calculation method. Stoch 1 Price field - stochastic 1 calculation prices. Stoch 1 Weight - weight of stochastic 1 values. Stoch 2 %K period - %K line period of stochastic 2. Stoch 2 %D period - %D line period of stochastic 2. Stoch 2 Slowing - deceleration of stochastic 2. Stoch 2 Method - stochastic 2 calculation method. 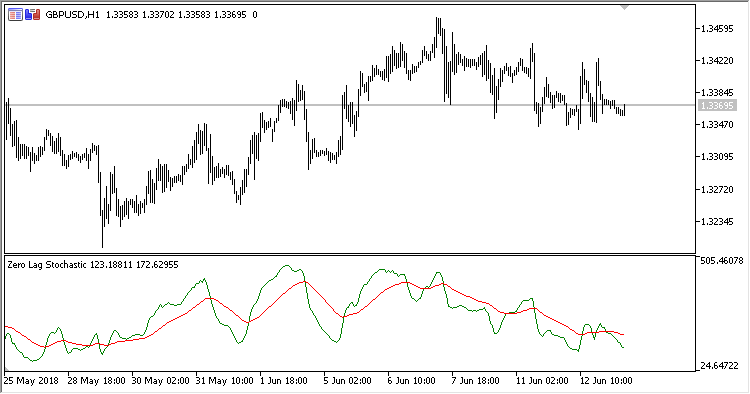 Stoch 2 Price field - stochastic 2 calculation prices. Stoch 2 Weight - weight of stochastic 2 values.